Item number 47 (Read Through The Bible Again) on my 50 Things To Do Before I'm 50 list is complete! 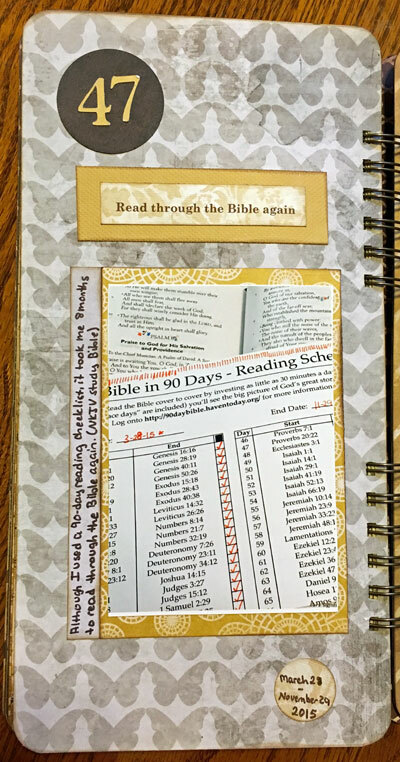 I included this goal on my 50 Things list because it had been a few years since I'd taken time to read straight through, although I have done a lot of reading and studying personally and in preparation for Bible studies I've lead and taught. 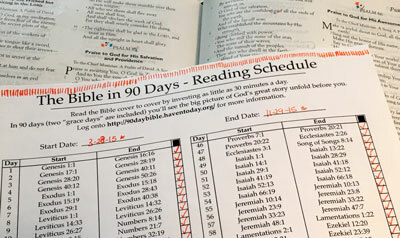 I actually began this read-through in late March of this year using a 90-day reading schedule, however I ended up taking eight months to complete it. 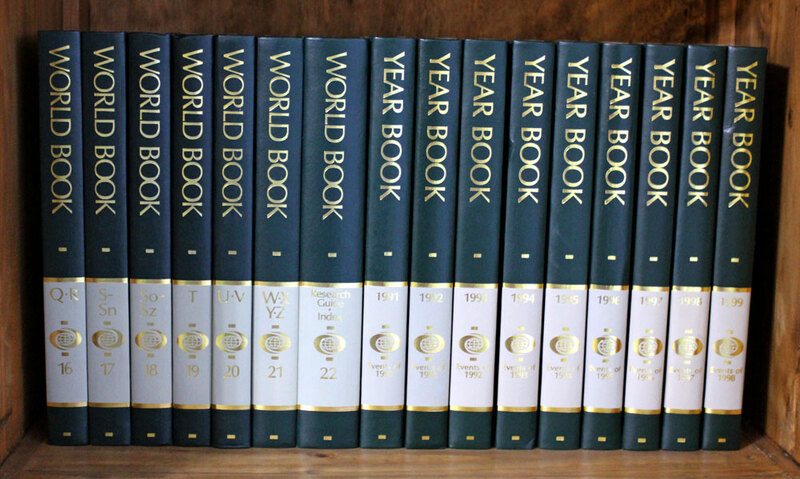 Regardless of the time, I am pleased to have read through the entire 66 books of the Bible in less than a year. I have numerous Bibles in several versions, however my favorite is the New King James Version. For this read-through, I used the NKJV Study Bible I purchased in 2006. This is the fourth time I've read through this particular Bible. Robbie and I used a different Bible when we read it through (out loud!) together in 2007, so I've completely read the Bible at least five times in the past 10 years. What I most love about reading the Bible is that I learn something new each time and different scriptures speak to me based on what's happening in my life. This year I was once again reminded that we don't have to be perfect for God to use us, we simply need a heart that seeks the Lord and His will. 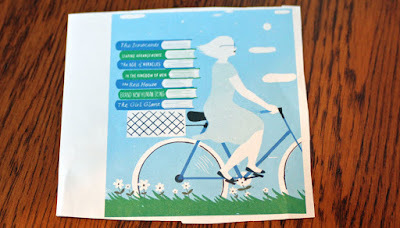 Here's a look at the completed page in my 50 Things To Do Before I'm 50 mini-album. 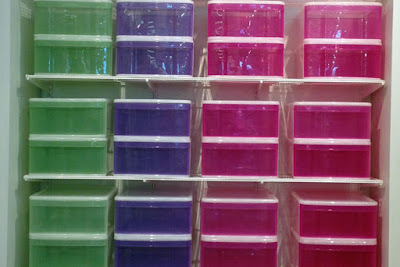 This post is the fifteenth in a blog series where I’m exploring various aspects of INSPIRATION. When I chose INSPIRATION as my word for this year, my first thoughts were about finding, acting on and (in some cases) limiting INSPIRATION. I also knew I wanted this word to motivate me not only in my scrapbooking and crafting but also in my physical, spiritual and intellectual goals. During my FUN year last year, I published a two-week series entitled Where Does My Inspiration Come From?, which looked at the many different sources of INSPIRATION specifically for scrapbook layouts. However, in this series, I’ll be sharing a word for each letter of the alphabet (from A to Z) that relates to INSPIRATION along with my random and in-depth thoughts on that word and the various ways it relates to INSPIRATION in our lives. Organization is defined as "the state or manner of being arranged in a systematic way" or "the act or process of putting the different parts of something in a certain order so that they can be found or used easily." 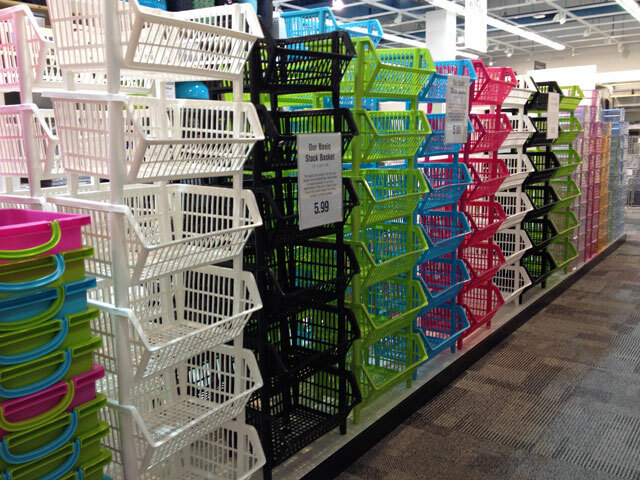 Personally I find lots of INSPIRATION in Organization. 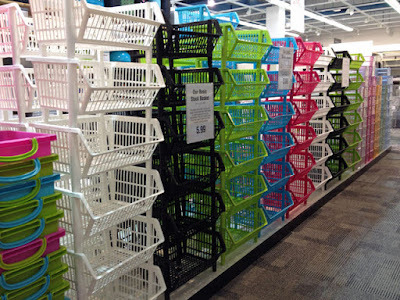 The act of organizing often sparks ideas and INSPIRATION. In contrast, when things are disorganized, I have a difficult time finding motivation or INSPIRATION. I am currently in the process of moving my craft room from one of the extra bedrooms (which I moved into a few years ago) to the front room. In fact, we are moving several rooms around, so this is a huge project that probably won't be completed for another couple of months. As with most Organization projects, there will be times of disarray as we move things around. Before I could move the shelves from the craft room to the front room, I had to take everything off of them . . . resulting in stuff being piled all over the table and floor! During this move, I'm making some changes in the storage and Organization of my craft supplies. 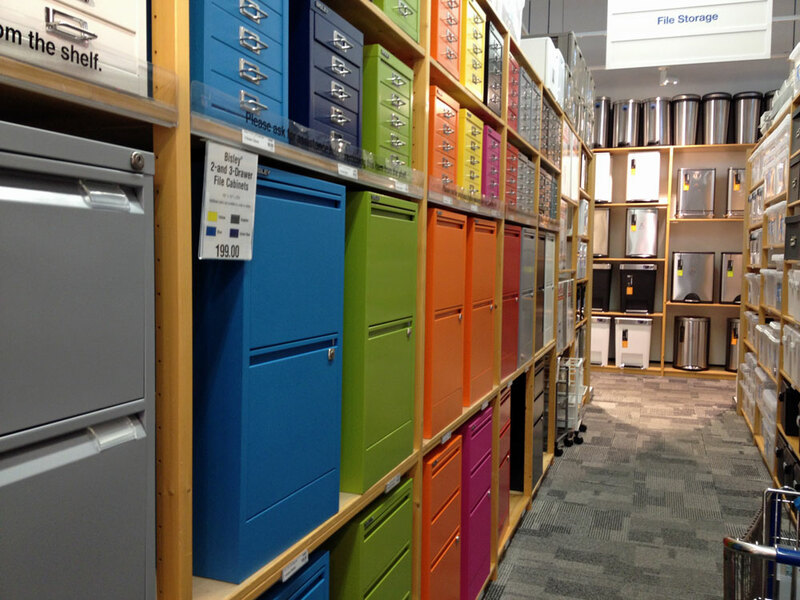 One of those changes involves my 12x12 paper, which I've stored in plastic drawers for the past ten years or so. 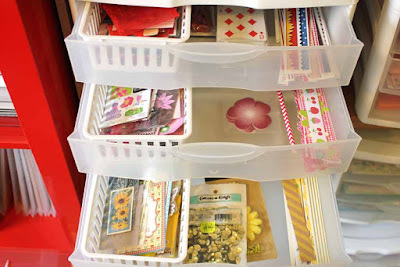 I recently purchased paper trays from Scrapbook.com that fit in the sections of my red Expedit. 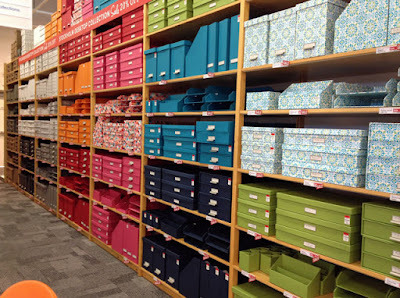 I have my paper sorted by color, with a slot for solid colored papers & cardstock and a separate slot for patterned papers. I am excited about this new Organization! This shelf unit is right behind my craft table, so I'm able to simply swing around in my chair and pull out the papers I need for a project. 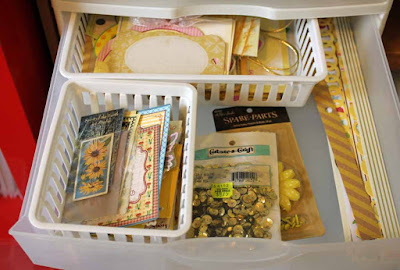 For the past five years or so, I've also sorted my embellishments by color and stored them in color bins. However, earlier this year I realized that I was not using the items in those bins as much because there was so much in them and it all tended to get jumbled together after a while. Some of this is due to the fact that I have a lot of supplies. I decided it was time for a new Organization method that would provide INSPIRATION to use these products. 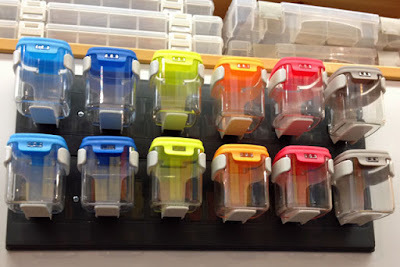 I purchased some inexpensive plastic drawer organizers for the 12x12 drawers that I'd previously used for my papers and sorted my color elements by size within the drawers. The biggest problem with an Organization project like this is that I had to really focus on completing the project! 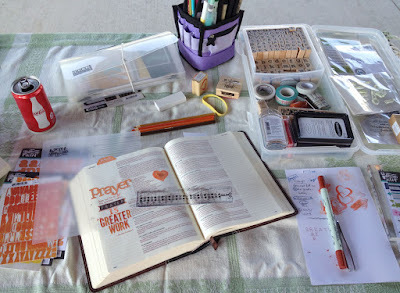 While I was sorting and putting all those FUN supplies in the drawers, I found lots of INSPIRATION and simply wanted to stop and scrapbook along the way! 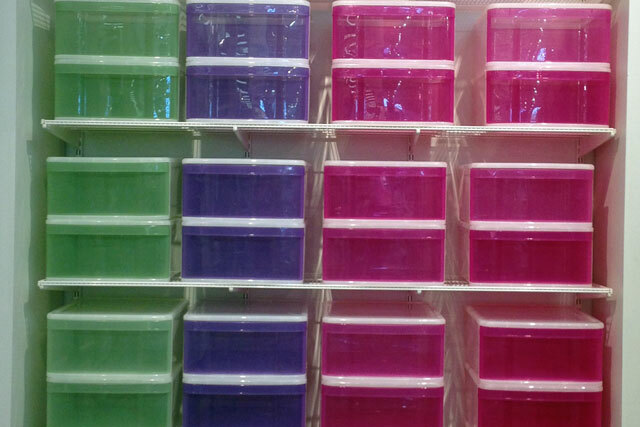 I must admit that I'm having a good bit of FUN as I'm moving and organizing my supplies! While we still have a ways to go with our moving project, my new craft room is set up enough that I can access most of my supplies, and I'm looking forward to a very crafty December. After hearing and reading quite a few reviews several months ago, I picked up a copy of Marie Kondo's new book, The Life-Changing Magic of Tidying Up: The Japanese Art of Decluttering and Organizing. I enjoyed the book, which was a fairly quick read, however I honestly didn't feel that I learned anything new from it. The system the author proposes is different from many traditional methods in that she advocates Organization and decluttering categories of items rather than areas in your home, yet the basic ideas of simplifying and organizing in order to keep things tidy is much the same. Her approach is definitely one leaning more toward minimalism, so there were many suggestions that didn't interest the collector side of my nature. I do like the idea of only keeping things that spark joy, however I won't be spending my time thanking inanimate objects for their contribution to my life. Despite the differences between Japanese and American culture and the size of our living spaces, there's lots of INSPIRATION in the book for taking a closer look at the items we allow to take up space in our homes and how we organize them. I recently created a Vision Board on Organization for a class I'll be teaching at our local library in January. Just looking at all the beautiful organized spaces on this board makes me smile! In preparation for the January class, I also read a short eBook by Christine Kane. The Complete Guide to Vision Boards (available free HERE) describes what a vision board is and provides step-by-step directions for preparing and creating your own vision board. I don't particularly agree with the idea that things manifest in our lives because of the vision board, rather I believe the board provides INSPIRATION that encourages us to seek out the items or goals on the board. 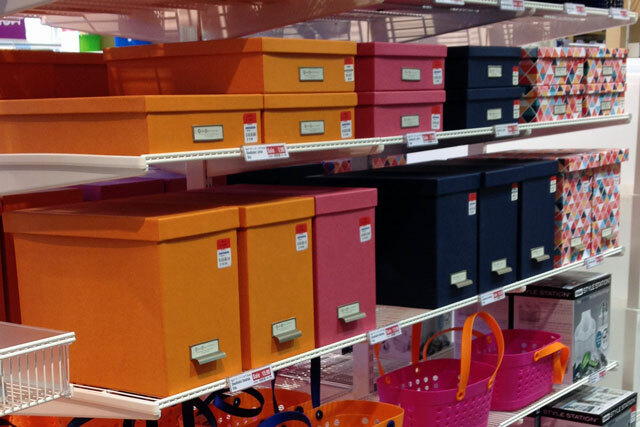 In summary, Organization and INSPIRATION often work together. Organization can provide the INSPIRATION to create, and INSPIRATION for change can begin with an Organization project. 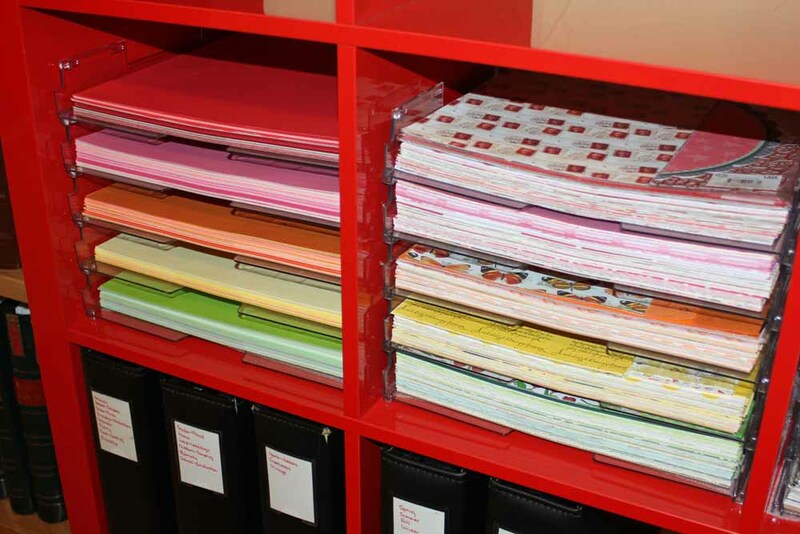 Do you have any ongoing Organization projects? 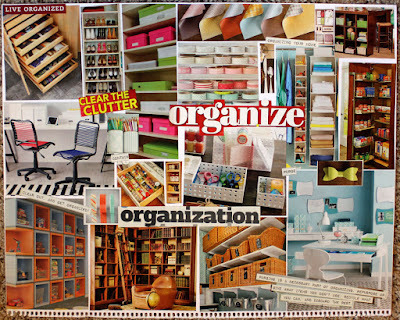 Please share your thoughts on Organization and INSPIRATION in the comments. This post is the fourteenth in a blog series where I’m exploring various aspects of INSPIRATION. When I chose INSPIRATION as my word for this year, my first thoughts were about finding, acting on and (in some cases) limiting INSPIRATION. I also knew I wanted this word to motivate me not only in my scrapbooking and crafting but also in my physical, spiritual and intellectual goals. During my FUN year last year, I published a two-week series entitled Where Does My Inspiration Come From?, which looked at the many different sources of INSPIRATION specifically for scrapbook layouts. However, in this series, I’ll be sharing a word for each letter of the alphabet (from A to Z) that relates to INSPIRATION along with my random and in-depth thoughts on that word and the various ways it relates to INSPIRATION in our lives. Nurturing is defined as "the act of encouraging, nourishing and caring for someone or something." Nurturing involves giving care and attention to aid in growth. Nurturing is providing support or nourishment and often requires a commitment of time. Sometimes it takes Nurturing to turn our INSPIRATION into action or tangible outcomes. For example, I have collected lots of INSPIRATION and ideas for scrapbook layouts, but for me to turn that INSPIRATION into a collection of layouts for our scrapbooks, I must spend time Nurturing this FUN hobby. 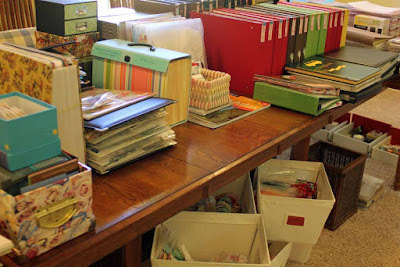 That Nurturing can take many forms - thinking about and planning how to preserve our memories, learning new techniques and designs through online or in-person classes, buying and organizing supplies, and, of course, actually taking time to create layouts. 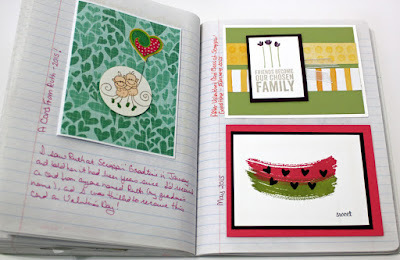 As an added bonus, scrapbooking is a Nurturing hobby! 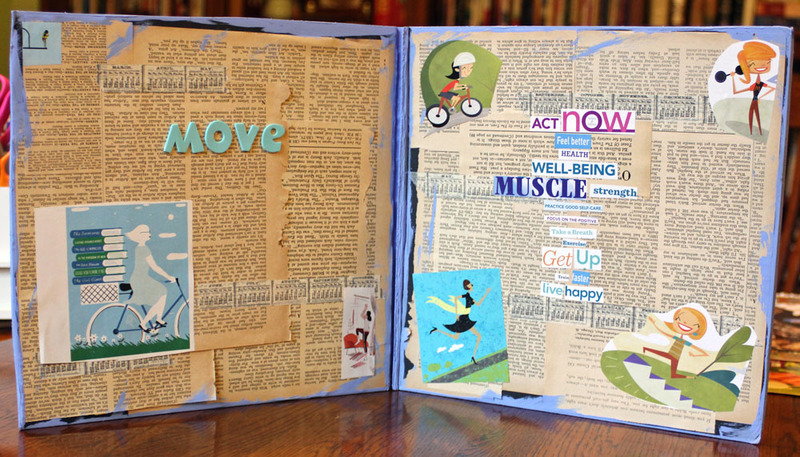 Check out this great article about how scrapbooking is good for your health - it helps lower stress, is a form of meditation, gives our brains a workout, supplies a social outlet, and keeps our hearts happy. In summary, Nurturing is important for growth and can be the conduit for acting on INSPIRATION. How does Nurturing play a part in your hobbies? Please share your thoughts on Nurturing and INSPIRATION in the comments. This post is the thirteenth in a blog series where I’m exploring various aspects of INSPIRATION. When I chose INSPIRATION as my word for this year, my first thoughts were about finding, acting on and (in some cases) limiting INSPIRATION. I also knew I wanted this word to motivate me not only in my scrapbooking and crafting but also in my physical, spiritual and intellectual goals. 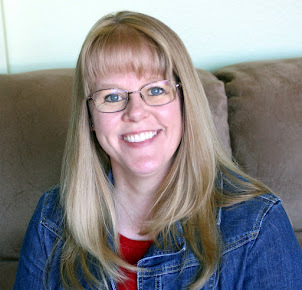 During my FUN year last year, I published a two-week series entitled Where Does My Inspiration Come From?, which looked at the many different sources of INSPIRATION specifically for scrapbook layouts. However, in this series, I’ll be sharing a word for each letter of the alphabet (from A to Z) that relates to INSPIRATION along with my random and in-depth thoughts on that word and the various ways it relates to INSPIRATION in our lives. After a successful year of weight loss and healthier living in 2014, this year I've regressed in some areas, particularly when it comes to regular exercise. So, adding Movement back into my daily routine has been on my mind quite a bit as we near the end of the year. I have been thinking about the types of motivation and INSPIRATION that will help me get back to incorporating more Movement into each day. In fact, I almost decided to adopt "move" as my word for next year to insure that I focus on it throughout the year. However, I decided there was no need to wait until 2016, and I set a goal for myself to add exercise Movement into my day every day beginning November 1! In addition to the benefits of feeling better and hopefully losing some of the weight I have re-gained, I decided on some rewards for additional INSPIRATION. 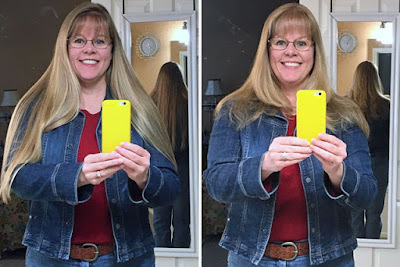 My goal is to exercise for 30 minutes each day, and to give myself a big boost as I started, my first reward (for seven days straight of exercise) would be an appointment to get my hair highlighted for the holidays. I was successful (and even exercised more than 30 minutes three of those days), and got a little trim, too. I was also successful in earning my second reward, a new workout outfit, after another seven days straight of exercise! I've been including several kinds of exercise Movement over these past few weeks - rides on the stationary bike here at home, walks with Robbie in our neighborhood, workouts with a personal trainer at the local recreation center, and strength training and exercise videos here at home. I'm halfway to earning a third reward - a new jacket for my wardrobe - for completing 14 straight days of exercise. This is actually much harder than the first two rounds, not only because it's twice as many days, but because these days have/will include a two-day trip to Scrappin' Goodtime in Corsicana, Robbie's birthday, a visit from Robbie's brother, Thanksgiving Day, and the long holiday weekend! I even created a FUN vision board to remind me to move more each day. 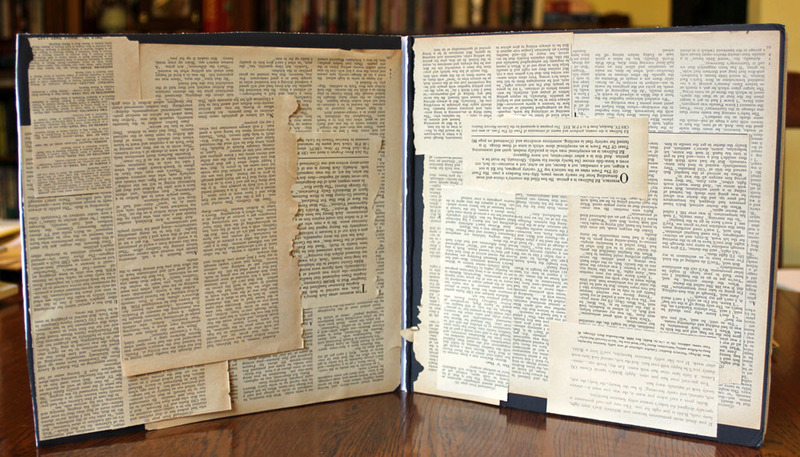 I had a piece of foam packaging that I trimmed down to begin my board, then I covered it with pages of text torn from old magazines. Zooming in, you can see that I actually adhered all the text upside down. This is a trick that I learned in Ali Edward's One Little Word class last year - it keeps the text from distracting from the overall theme . 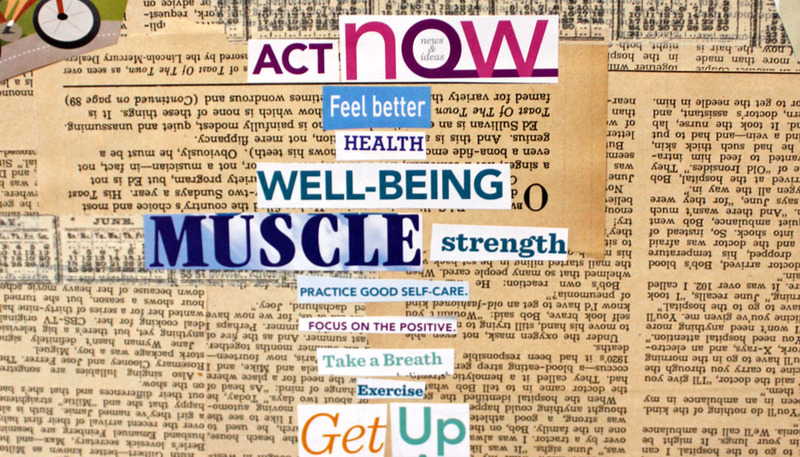 I flipped through magazines and added a list of words that all reflect Movement and healthy living benefits. I completed the vision board by adding other graphics that also showed women incorporating Movement into their everyday lives. In summary, incorporating Movement into our everyday lives leads to many health benefits which can be the actual INSPIRATION and motivation to include more Movement. 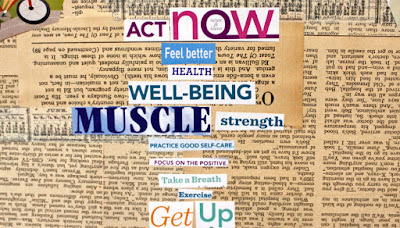 What Movement do you regularly incorporate into your days? Please share your thoughts on Movement and INSPIRATION in the comments. The word "Genesis" means "the origin or coming into being of something." It is also the name of the first book in the Bible, which starts with the words "In the beginning God created." Later in that first chapter of Genesis, we learn that "God created man in his own image, in the image of God created He him; male and female created He them." Therefore, since we are created in the image of The Creator, we are all creative! 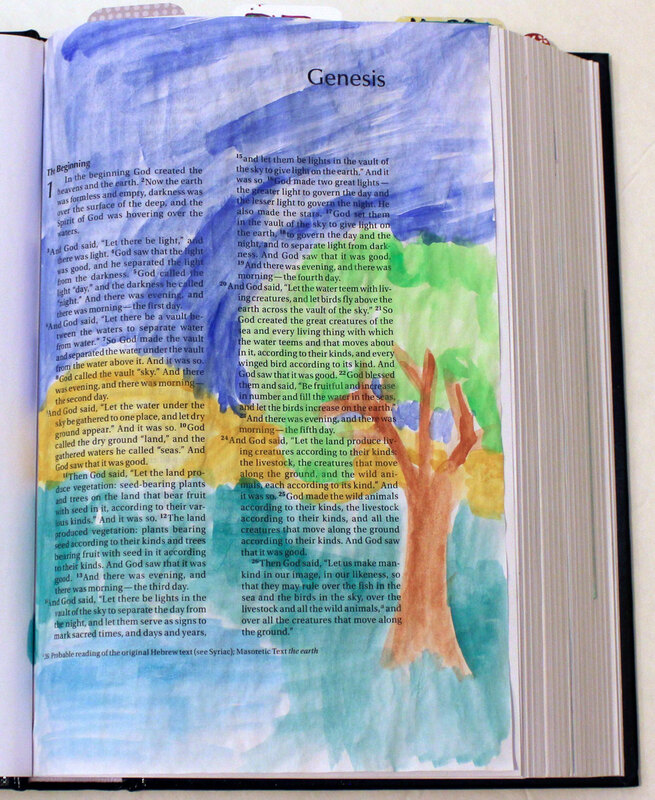 This is one of the facts that I like to share in my Bible Journaling workshops, and then I share examples of how I've illustrated this first chapter of Genesis in several Bibles. 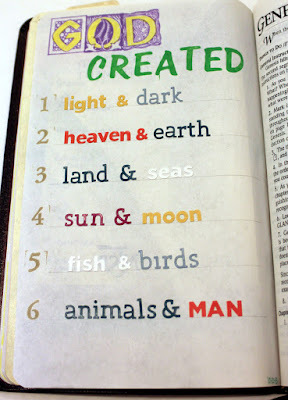 As you can see, each of these pages illustrates Creation, although they vary in design and products used. 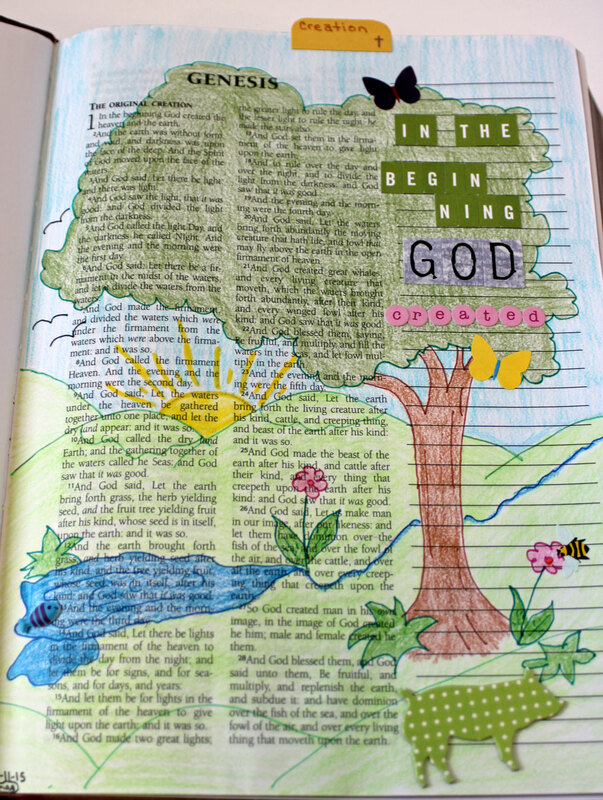 However, the important thing about these pages is not which design is "better" or which one best uses the latest products or even which one is the "most complete" - the important thing is that as I worked on each of these illustrations, I spent time meditating on the fact that "In the beginning God created!" In fact, from nothing (a void with no form), He created the beautiful world that we live in today. And then He created us in His own image! Sometimes the scriptures we are most familiar with or have heard often become simply words on a page and we don't take time to think about and appreciate the meaning behind those words. I can quote the first few verses of Genesis without much thought, but when I take time to really think about the story those words tell, I cannot help but once again stand in awe of the creativity of the Lord and be filled with gratitude that He placed that creativity inside each of us! How have you used your creativity lately? Our library book club read The Madonnas of Leningrad by Debra Dean several years ago, however quite a few new members have joined our group in the past couple of years, so it was chosen as one of the selections again this year. The book follows Marina, an elderly Russian woman who is losing her memory. Actually she has very vivid recall of events that occurred when she was a docent at the Hermitage during World War II and the German Army's siege of Leningrad. During those years, Marina created a "Memory Palace" in her mind to help her remember and visualize the paintings and other art pieces that were removed from the Hermitage for safe hiding during wartime. Descriptions of several of the art pieces from the Hermitage are interspersed throughout the book, typically foreshadowing the events of the upcoming chapter. I remember reading this book back in 2007. I remembered the story of Marina in the Hermitage and the descriptions of the artwork and the trials she faced during that long winter of the siege. However, I laughed when I started reading and realized I had completely forgotten the part of the story about Marina as an older woman losing her memory. Like Marina, I didn't remember any of those "current" memories, just the story from her past. I was slightly disappointed in the ending to the story as Marina never shares her memories of the past with her daughter who desires to be an artist. The leader of our book club actually brought in printouts of the pieces of artwork that were described in the book, which was an added bonus to our discussion. This is a great book that deals with memory loss and lifelong love and works of art and the history of Leningrad during the war, and I highly recommend it. The Things That Keep Us Here by Carla Buckley is the story of Ann Brooks and her family at the outbreak and during a pandemic caused by an avian flu. When the flu reaches their area, everyone goes into panic mode and rushes the grocery store to stock up on items. Ann has two daughters and her estranged husband returns home with his graduate assistant who has nowhere else to go as everything begins shutting down. The story follows this family and the decisions they make as the pandemic takes the lives of people all over the world. This was a fairly good book because I definitely wanted to keep reading to see what happened next, however it did not have a satisfying ending at all. There was a prologue that wrapped everything else up with a glimpse of some of the characters several years later, however I felt the ending was rather abrupt. There were also things that seemed quite unbelievable in the story. Ann's husband Peter was a researcher watching this flu move from one area to another, yet they were an unprepared as everyone else when the pandemic arrived in their area. Also, they continued to have good water for a very long time, despite the electricity being off and many businesses and services closed down due to deaths. And, Ann was consistently cleaning everything with bleach throughout the story - really, how much bleach did she have on hand when this all started? I just finished The Perfume Collector by Kathleen Tessaro. This book follows the story of two women. The first is Eva d'Orsey, a teenage orphan working as a maid in a New York hotel in the 1920s. The story of her life is interspersed with that of Grace Munroe, a London socialite in the 1950s. This is one of several books I've read this year with this type of format - one chapter tells Eva's story, then the next chapter jumps to Grace's story, and eventually the two stories come together in a twist that was never a surprise. While I liked the story, I did not enjoy the format because I already had the conclusion figured out very early in the book. Part of the book jacket description reads: The Perfume Collector explores the complex and obsessive love between muse and artist, and the tremendous power of memory and scent. Eva inspires one of Paris' greatest perfumers, thus there are quite a few descriptions of scents and perfume-making throughout the book, which was somewhat interesting. Overall this was an ok book that was a quick read. I'm looking forward to the book club discussion in a couple of weeks to hear what others thought of it. Are you in a book club? Have you read any of these fiction books? Please share your thoughts in the comments. 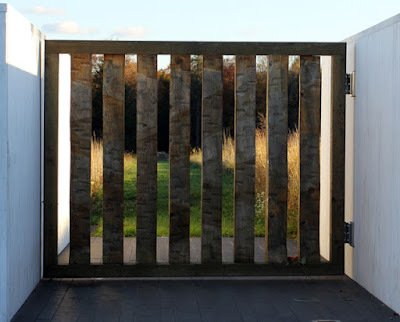 This post is the twelfth in a blog series where I’m exploring various aspects of INSPIRATION. When I chose INSPIRATION as my word for this year, my first thoughts were about finding, acting on and (in some cases) limiting INSPIRATION. I also knew I wanted this word to motivate me not only in my scrapbooking and crafting but also in my physical, spiritual and intellectual goals. 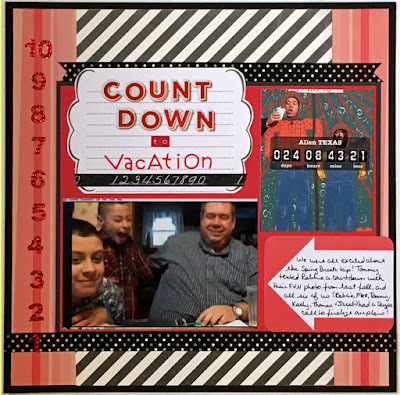 During my FUN year last year, I published a two-week series entitled Where Does My Inspiration Come From?, which looked at the many different sources of INSPIRATION specifically for scrapbook layouts. However, in this series, I’ll be sharing a word for each letter of the alphabet (from A to Z) that relates to INSPIRATION along with my random and in-depth thoughts on that word and the various ways it relates to INSPIRATION in our lives. Learning is defined as "the activity or process of gaining knowledge or skill by studying, practicing, being taught, or experiencing something." Learning is the process through which we acquire new information or build on information that we already know. As children, we spend most of our time Learning, at home, at school, wherever we happen to be. Learning opportunities are everywhere and we soak up new information and try out new activities instinctively. We are ok with taking risks to try new things and staying out of ruts, which Kurt Anderson (in his foreword to Spark) calls Amateur Spirit. However, as we age mature, our days are often filled with many tasks and routines and Learning opportunities, while still abundant, are more difficult to fit into our busy everyday lives. In essence, we lose that Amateur Spirit. And yet, we often feel the INSPIRATION or have a need to learn something new or to improve our skills or knowledge in a particular area. That INSPIRATION, desire, and/or need help us find (or make) time for Learning. Speaking of time - have y'all heard the 10,000 hour rule? I first read about this rule in Malcolm Gladwell's book, Outliers: The Story of Success (which I reviewed HERE). This rule basically states that to be expert at something requires 10,000 hours of practice. The book is filled with examples of individuals who spent years practicing and studying and Learning to gain a level of mastery. However, this rule is often misquoted to say that it takes 10,000 hours to learn something new or to become good at something, which can be quite discouraging for those of us who want to learn something new, right? Ten thousand hours is a long time! The INSPIRATION for Learning something new can come from many sources. Earlier this year, Robbie and I listened to the audio book of The Invention of Hugo Cabret. Neither of us had ever read this book, and we found it to be a wonderful story, which also led to our Learning some new things. Another Learning opportunity from the book revolves around the movie-maker George Melies. I assumed this was a fictional character, however Robbie recognized the name and knew about his Man in the Moon photo/movie. We actually looked up more information about George Melies. So, from this one book (and the movie Hugo, which we watched after listening to the book) we learned about automatons, George Melies, and some history of movies and movie making. As a huge proponent of lifelong Learning, I love this quote by Albert Einstein. In summary, we often need INSPIRATION before we make time for Learning, and to continue to grow we must find the INSPIRATION to continue Learning throughout our lifetime. How many hours are you willing to invest in Learning something new? Please share your thoughts on Learning and INSPIRATION in the comments. Prayer, time spent communicating with the Lord, is an important part of my life. I believe it is a foundational aspect of the Christian life. However, this is an area where I always feel I can make improvements. I'd like to wake up each morning and spend time in prayer, communicate with God throughout the day (not just when I need/want something), and end each day thanking the Lord for His goodness. I often fall short of this desire, so I include things in my life that remind me to pray and remind me of the awesome power of prayer. 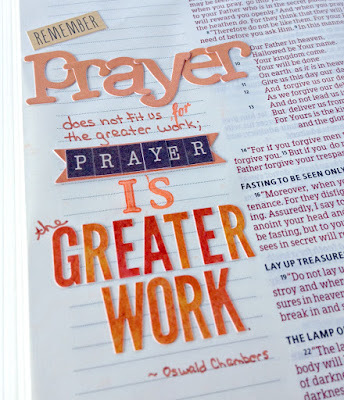 As with most things I enjoy and want to learn more about or practice more, I often read books about prayer. I recently completed two excellent books on the power of prayer. 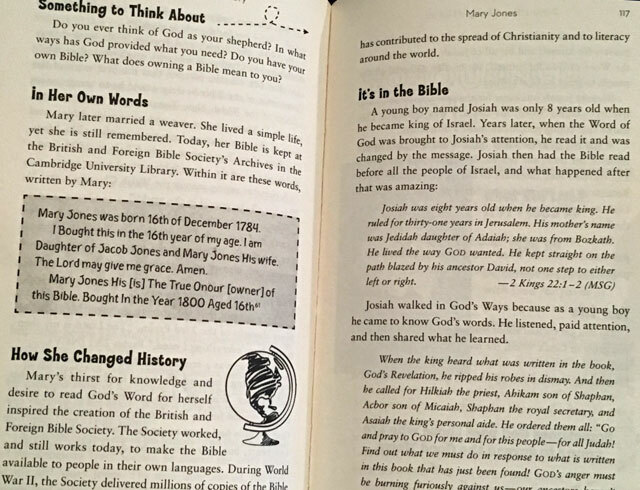 Prayers That Changed History is a children's book that shares the stories of 25 people who changed the world through their prayers. The chapters are arranged in chronological order beginning with Polycap (who lived from 69AD until 155AD) and Constantine (272-337) and ending with Corrie ten Boom (1892-1983) and Dietrich Bonhoeffer (1906-1945). 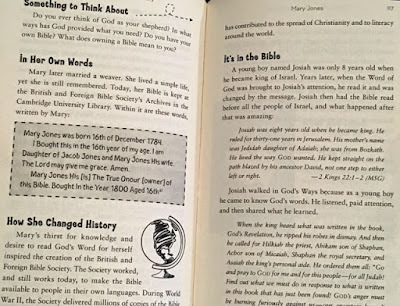 Each chapter shares a brief story of the life of that individual and how his or her prayer(s) changed history, then includes questions to think about and a similar story about someone in the Bible. My friend Rita is a prayer warrior, someone who prays regularly for others. She also reads about prayer and often shares books with me that she's read. Recently she sent me Stormie OMartian's Prayer Warrior, a fabulous book for those who desire a meaningful prayer life that helps advance God's kingdom and glory. I always enjoy Stormie OMartian's books because she shares personal examples of how prayer has impacted her life and family and includes sample prayers with scriptures at the end of each chapter. I also find that taking time to meet with others for prayer, whether in a church service or special prayer meeting, is an excellent way for me to include more prayer time in my life. 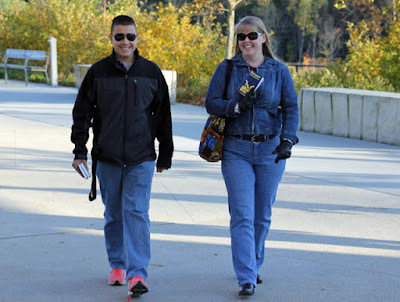 Recently a friend of mine invited a few of us to meet with her at a local park once a week to pray for specific needs within our communities and throughout our country. One morning I arrived early and spent time doing some Bible Journaling. I had read a quote in the Prayers That Changed History book and decided to include it in my Bible near the Lord's prayer in Matthew Chapter 6. Here's a closer look at this thought-provoking quote by Oswald Chambers. During our time of prayer together, we discussed this quote, shared prayer requests, and took time to pray for the needs of each other, our church, our local community, and the upcoming presidential elections. These times of prayer with others help me take time to pray for things outside my usual prayer list and allow me to stand in faith with other believers as we seek answers to those prayers. 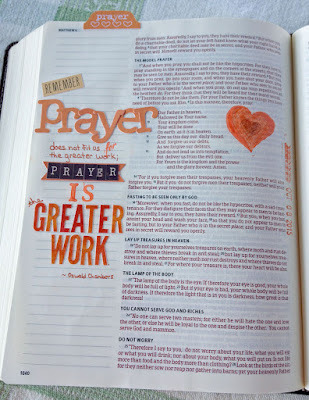 Taking time to write my prayers is a tangible way that I can express my desires and praises to the Lord. 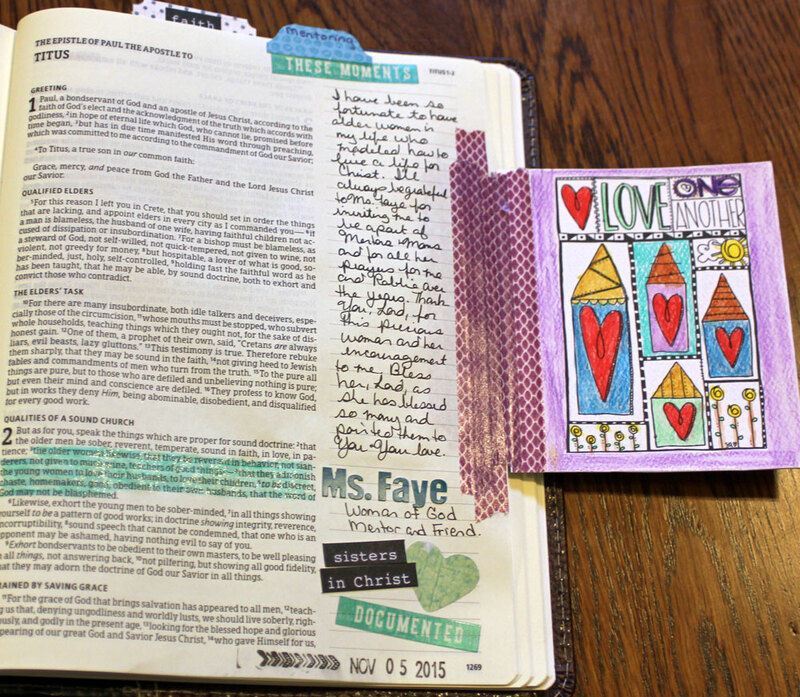 I find that I am often including written prayers on my illustrated Bible Journaling pages. 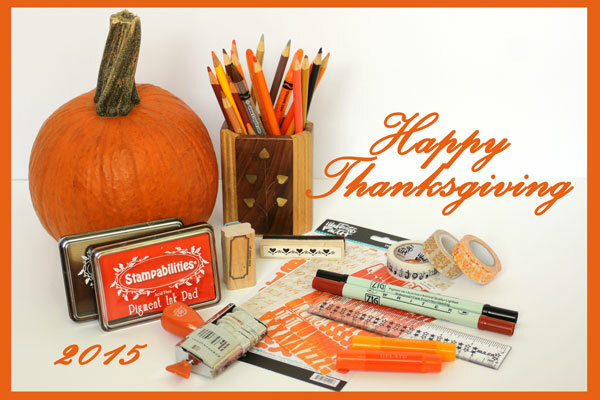 Recently, I created a tip-in using one of the new Art Play Paintables papers. 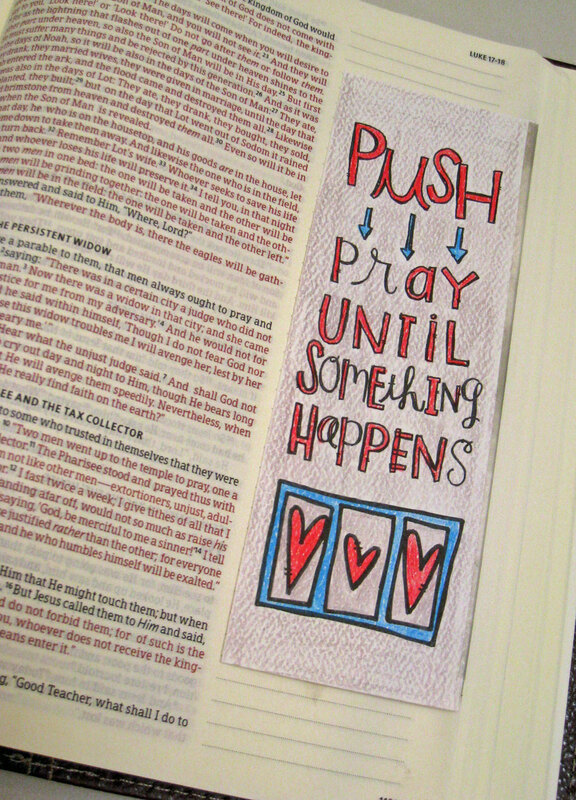 I colored in the quote, then added this strip into my Bible using washi tape along the edge of the page. On the back of this strip, I've written out a prayer that I've been repeating over and over recently. I included this in my Bible alongside the story of the Persistent Widow in the book of Luke, which is a reminder for us to continue to ask the Lord until we receive an answer! 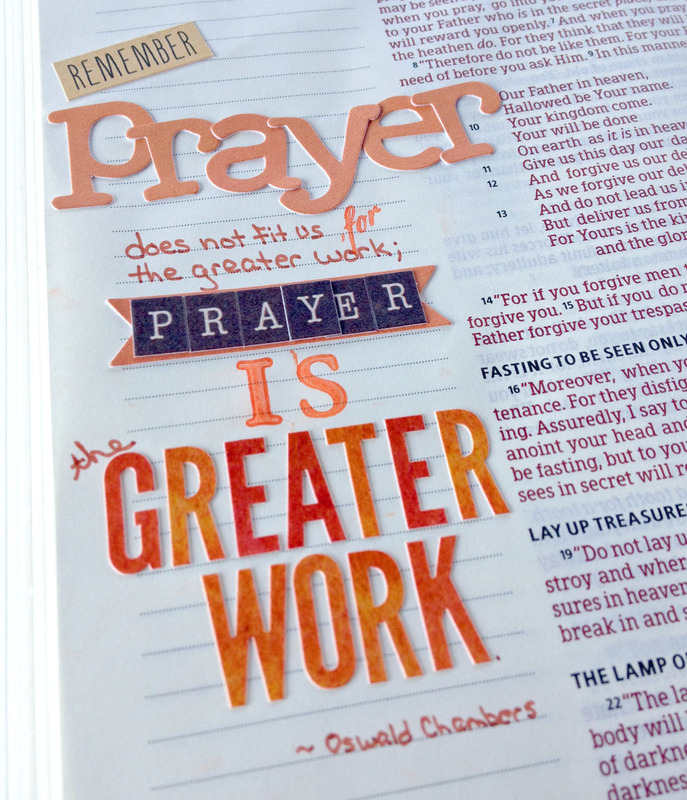 What do you do to help you keep prayer an integral part of your life? 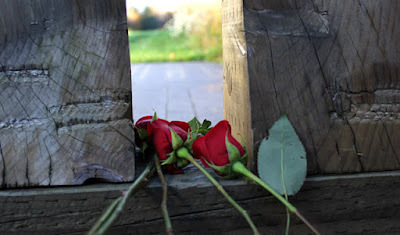 This post is the eleventh in a blog series where I’m exploring various aspects of INSPIRATION. When I chose INSPIRATION as my word for this year, my first thoughts were about finding, acting on and (in some cases) limiting INSPIRATION. I also knew I wanted this word to motivate me not only in my scrapbooking and crafting but also in my physical, spiritual and intellectual goals. 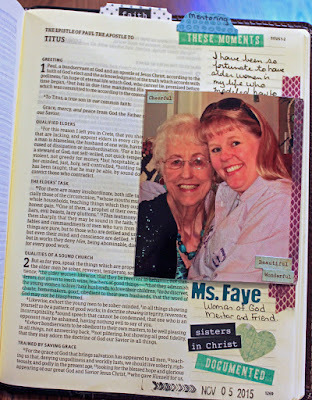 During my FUN year last year, I published a two-week series entitled Where Does My Inspiration Come From?, which looked at the many different sources of INSPIRATION specifically for scrapbook layouts. However, in this series, I’ll be sharing a word for each letter of the alphabet (from A to Z) that relates to INSPIRATION along with my random and in-depth thoughts on that word and the various ways it relates to INSPIRATION in our lives. Knowledge is defined as "information, understanding, or skill that you get from experience or education" and "awareness of something" and "the body of truths or facts accumulated in the course of time." In essence, Knowledge is obtained by becoming familiar with something through experience or association. I am a huge proponent of life-long learning, so my desire to learn is the INSPIRATION for acquiring more Knowledge about a particular subject or skill. We gain Knowledge through experience, practice, questioning, experimentation, reading, observation, listening, and study. I enjoy reading and studying about various subjects, which is one way to become familiar with a subject. However, I believe that when we experience something personally, we gain more Knowledge. As we've watched some of the tragic news coming from Paris, France, this weekend, our hearts are filled with sorrow and sympathy for the people there who have lost loved ones as well as for those throughout the city and country who are feeling the effects of these devastating attacks. While I am praying for all those affected, I am reminded of the attacks here in the states on September 11, 2001. I was teaching classes at a community college in Texas the morning of the attacks, so in a sense I was well removed from the actual events. However, the shock, sorrow, fear, and anger spread through our community as we all watched the news for days on end. The spirit of patriotism was strong and gatherings for prayer were abundant. Living through this experience is what gives me Knowledge about the events that occurred that day. Obviously I do not have all the information available about those attacks and everyone involved, but I have a familiarity that will remain with me always. As I mentioned when I wrote about Experiences for this blog series, often we find INSPIRATION to visit a particular place in order to learn (or gain more Knowledge) about something. 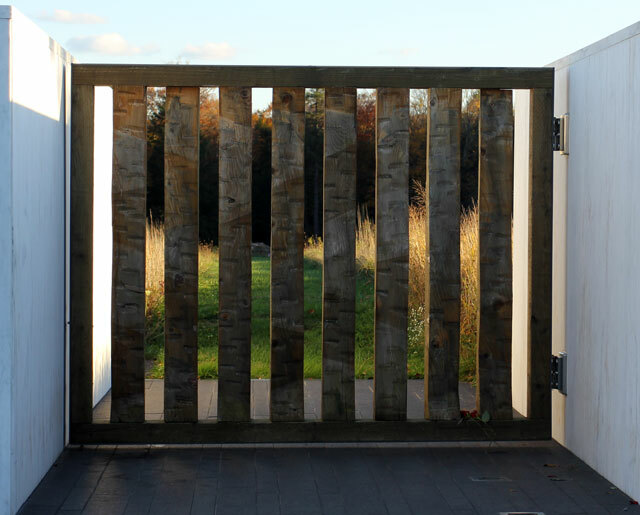 On our vacation last month, we stopped to visit the Flight 93 Memorial in southwestern Pennsylvania. This is the location where the plane crashed when the passengers and crew of Flight 93 attempted to overtake the terrorists that intended to fly this plane into the U.S Capitol. 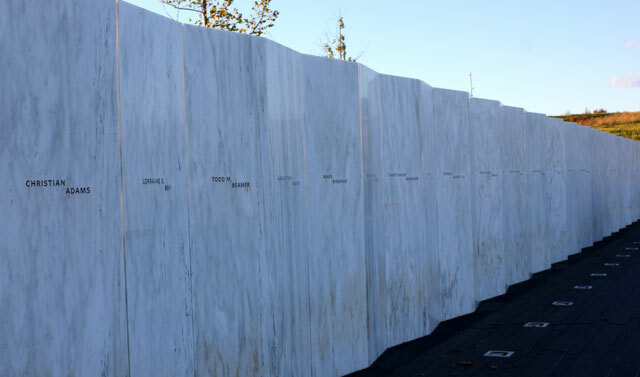 There is a wall at the Memorial site with the names of each passenger and crew member who lost their life as the plane crashed into a field. Even though I'd seen footage of the site and heard and read this story numerous times, it still brought tears to my eyes to look down the path of the crash site. The heroics of those on Flight 93 as well as so very many others across our nation that day is something we'll always remember. I believe it is also important that we share our Knowledge with others, particularly younger generations. As we approached the memorial, we took time to read (once again) about the attacks on America. I love this photo showing our youngest nephew looking to see the spot that is shown in the photo. He's very observant, and I believe this experience will help him better understand the events of a day that happened long before he was born. And although we were somber as we read the names of those who lost their lives, we were also able to enjoy the fact that we could stop and pay tribute to those brave men and women. We have a US Parks passport book that has spaces for stamps showing when and where we've visited nationals parks and monuments throughout the states. I love the fact that our nephews will be able to look back and remember visiting these places and gaining more Knowledge about our country and its history. This post took a little different turn as I wrote today because my heart is heavy knowing that another country has been hit with a terrorist attack that will leave repercussions on the lives of so many, but I hope that somehow this still brings together Knowledge and INSPIRATION in our daily lives. In summary, the desire for Knowledge often provides the INSPIRATION needed for acquiring that Knowledge. What's your favorite way to gain Knowledge? Please share your thoughts on Knowledge and INSPIRATION in the comments. This post is the tenth in a blog series where I’m exploring various aspects of INSPIRATION. When I chose INSPIRATION as my word for this year, my first thoughts were about finding, acting on and (in some cases) limiting INSPIRATION. I also knew I wanted this word to motivate me not only in my scrapbooking and crafting but also in my physical, spiritual and intellectual goals. 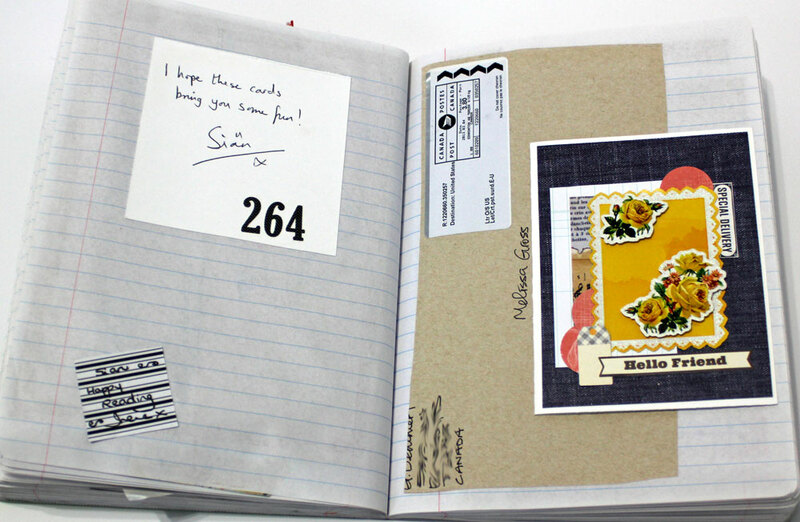 During my FUN year last year, I published a two-week series entitled Where Does My Inspiration Come From?, which looked at the many different sources of INSPIRATION specifically for scrapbook layouts. However, in this series, I’ll be sharing a word for each letter of the alphabet (from A to Z) that relates to INSPIRATION along with my random and in-depth thoughts on that word and the various ways it relates to INSPIRATION in our lives. 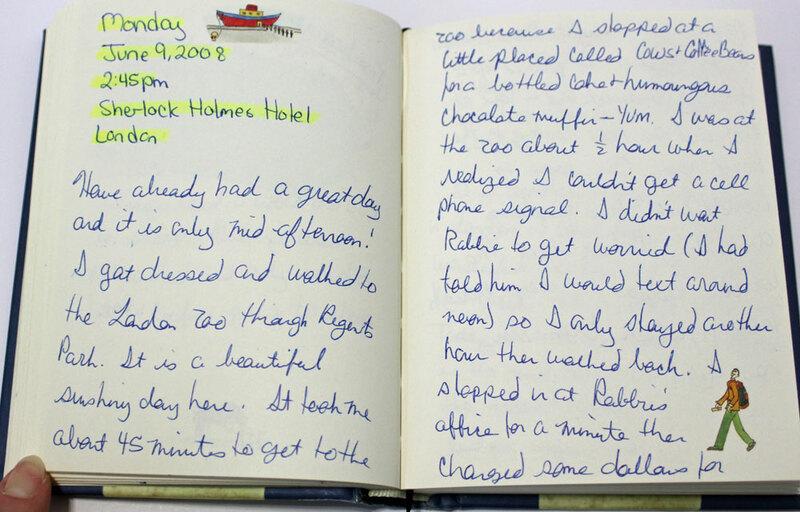 Journaling is defined as "the activity of keeping a diary, also known as a journal" and "keeping track of events by recording them in a log." 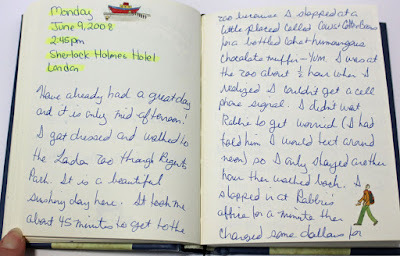 The INSPIRATION for Journaling typically comes from several desires: to capture stories and memories, to understand and analyze feelings and circumstances, to reduce stress, to write, to plan, to create art etc. 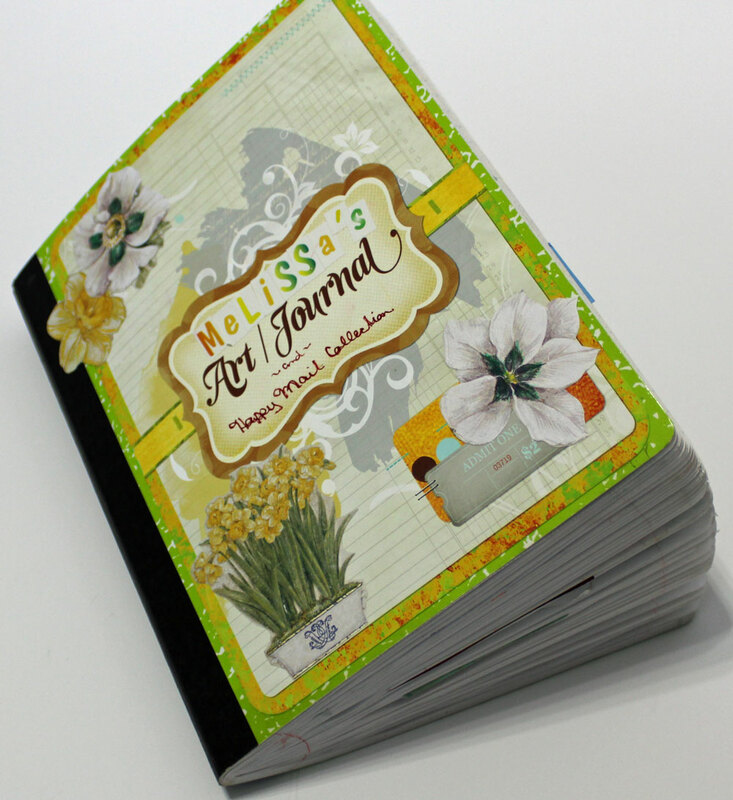 The most basic form of Journaling involves simply writing in a journal or notebook or on loose leaf papers. 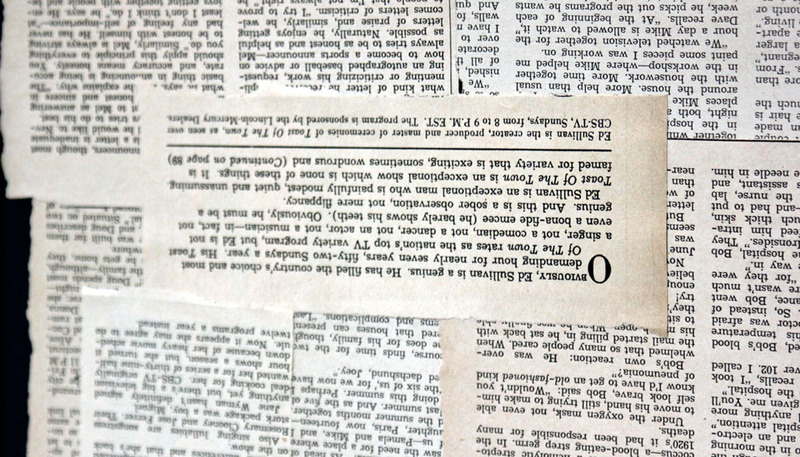 In the technological age that we are living in, many people prefer to type their Journaling into a word processing document or even to publish it as blog posts. 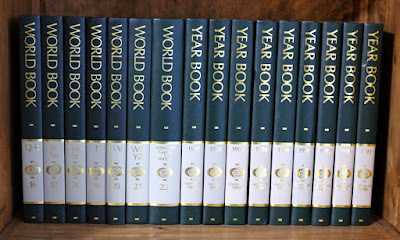 In fact, Journaling about an infinite array of topics can be found on blogs. 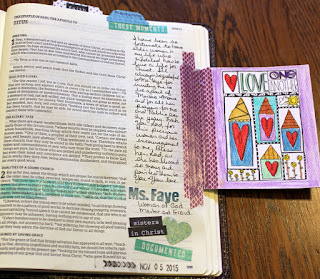 I've journaled at various times throughout my life, often for different reasons. During a very rough time in my life, the counselor I was working with suggested that I journal my feelings as I struggled with strong emotions and borderline depression. Since I was paying for this advice, I (of course) got a journal and wrote often. It was extremely therapeutic, and I highly recommend it. Although I would caution that this type of Journaling is best kept private for it to be the most effective. Before Robbie and I married, I read through my journals from that difficult time, pulled out a few pages I wanted to keep (like when I wrote about the day Robbie proposed), and shredded the rest. Julia Cameron's book, The Artist's Way, was my INSPIRATION for trying Morning Pages - three pages of stream of consciousness writing each day. I enjoyed this form of Journaling and have returned to it sporadically over the past few years. 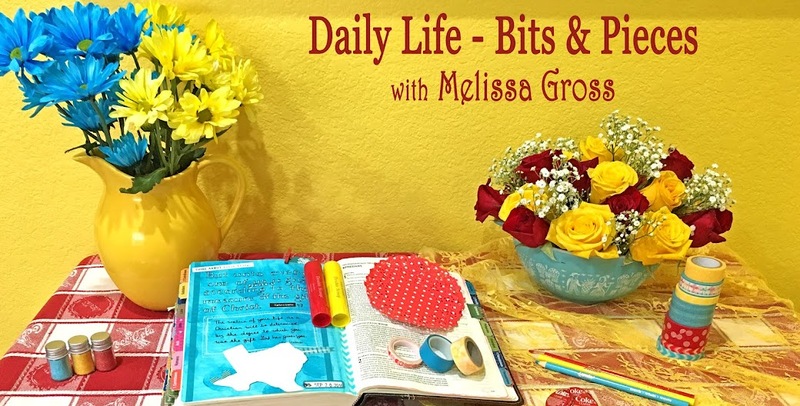 It's a great way to do a "brain dump" at the beginning of the day. 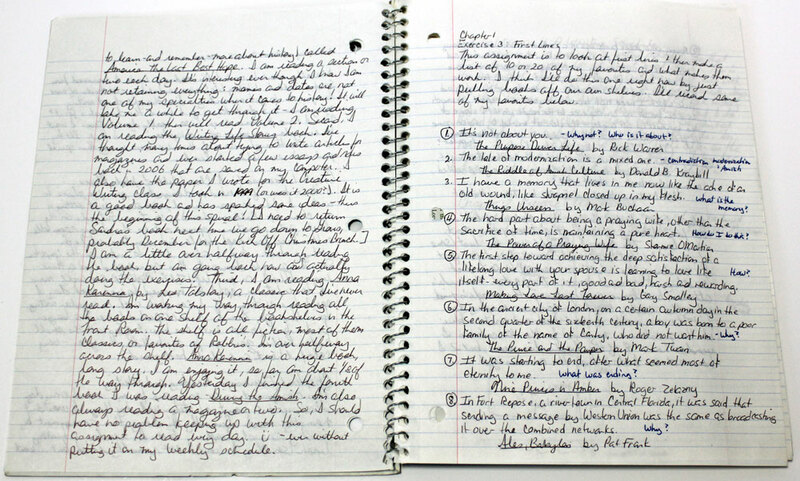 I often find INSPIRATION for Journaling from books on writing and have several notebooks with writing based on the suggested exercises, like these pages based on the book Writing Life Stories. 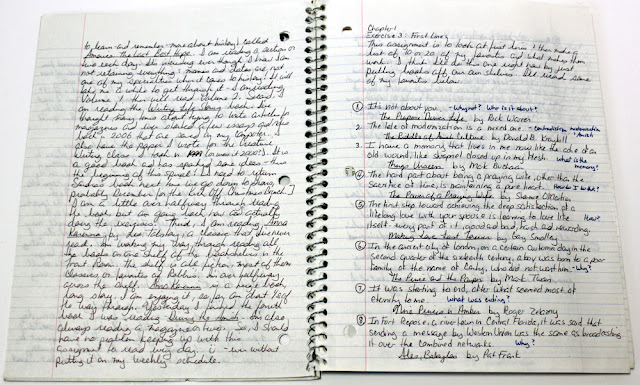 There are a variety of Journaling methods, different ways of recording activities, events, thoughts, opinions, and feelings. 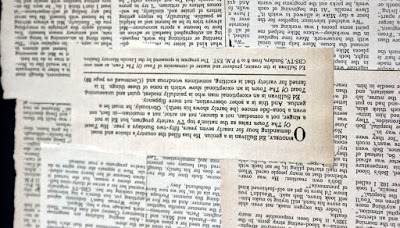 The Urban Dictionary defines Journaling as "a hobby that is a cross between scrapbooking, journal writing, collaging, and in many instances, sketching, not to be confused with online Journaling, this sort of Journaling refers to the type that results in a tangible notebook of images and words that creatively depict ideas and events in an individual's life." My first attempt at Art Journaling was in late 2010 as part of a class from Jessica Sprague. I used a composition book to begin the journal, which I didn't do much in until almost a year later when I created a few collage style pages. 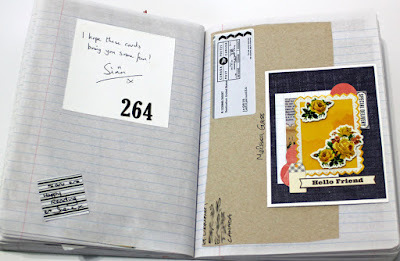 Since then I've added art Journaling pages to that book sporadically, although it is bulging . . .
. . . because I also use it as a place for mail art, cards, and other FUN items I receive in the mail. 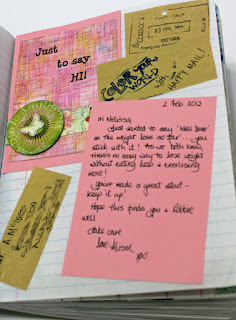 A couple of months ago, I read Art Journal Courage by Dina Wakley. 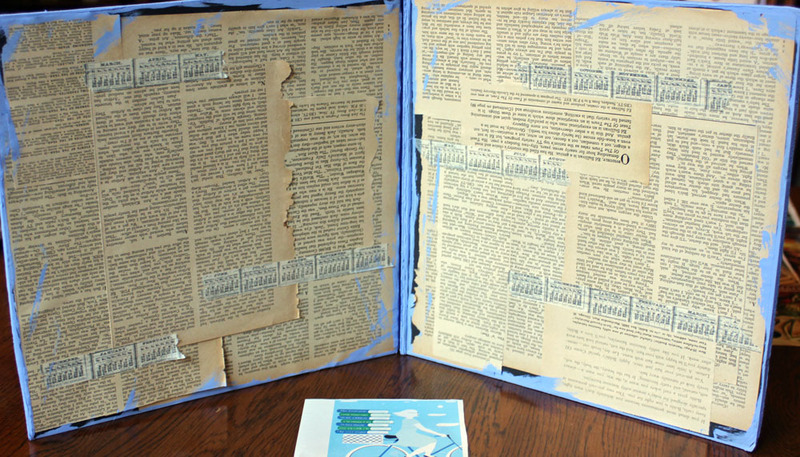 It was filled with INSPIRATION for art Journaling. 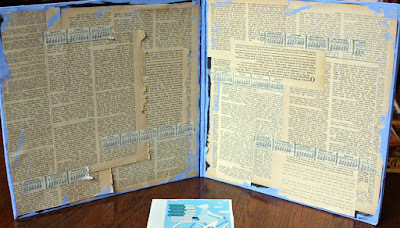 Since I had checked the book out from the library, I did not have much time to act on all the "fearless mixed media techniques for Journaling bravely" (according to the book's sub-title). 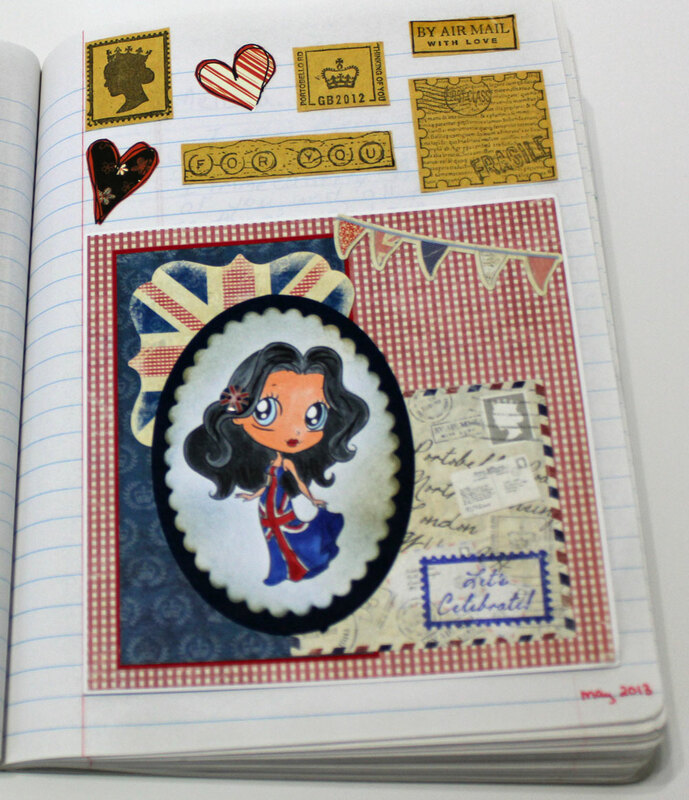 However, it was that book that prompted me to put Art Journal Freedom, Dina's first book, on my birthday list. As some of you already know from my monthly INSPIRATION reviews, it's been in my to-read-and-act-on pile for a few months now. 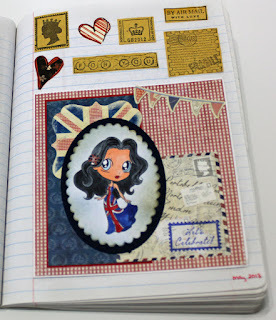 One of my favorite Journaling activities is adding details and stories to my scrapbook layouts. Sometimes I'll include a large block of Journaling that covers most of the page, but most often I'll add a smaller block of Journaling to share an anecdote about the photos I'm highlighting. We were all excited about the Spring Break trip! and all six of us had a Skype call to finalize our plans! There are also books that provide INSPIRATION for this type of Journaling. A couple of months ago, I enjoyed Writing in the Margins: Connecting with God on the Pages of Your Bible by Lisa Nichols Hickman. This book contains examples of various people who have journaled in their Bibles over the years. Each chapter ends with questions and suggested activities, which I'll be working my way back through as I continue this practice of illustrated Bible Journaling. One of my favorite times to journal is when we're traveling. I like to carry a journal along where I can record the things we do, sites we see, foods we eat, etc. Sometimes I'll create a special journal to take along on a trip, while other times I'll grab a journal from my stash. 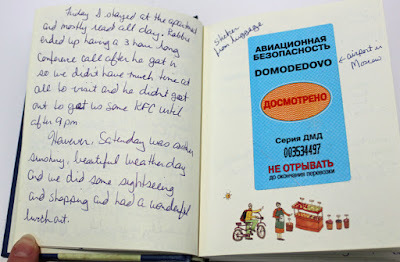 This little journal traveled with us overseas in 2007 and 2008, and it's so much FUN to read back through my Journaling, see the ephemera, and re-live those trips. 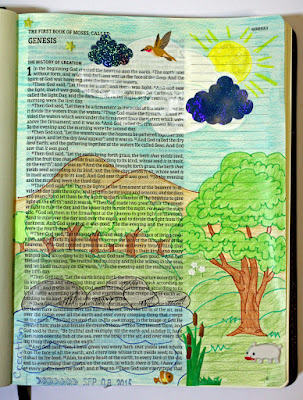 In summary, Journaling & INSPIRATION are intertwined. The INSPIRATION for Journaling comes from a variety of desires and sources, and Journaling can spark INSPIRATION and ideas that can lead to greater understanding of self, artistic endeavours, and creative expression. 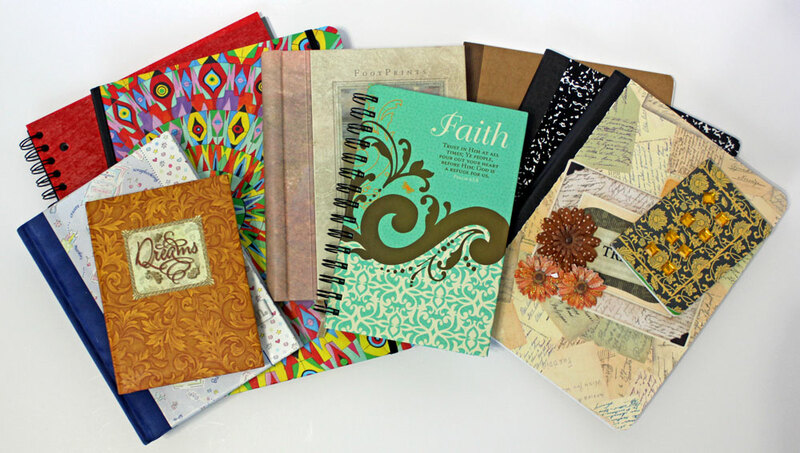 What type of Journaling do you enjoy? Please share your thoughts on Journaling and INSPIRATION in the comments. The $250 Neiman Marcus Cookie Recipe "Myth"